HerHandgun classes are held in Mesa, Arizona. The range, Rio Salado Sportsman’s Club, is in the East Valley. Instructors, Kippi Leatham and Debbie Keehart, are National and International USPSA / IPSC Pistol Champions. With over 4 decades of combined competition experience, they know what it takes to become a successful shot. Kippi and Debbie provide quality instruction, ranging from the basics of proper stance, grip, sight alignment and trigger pull to the more-advanced techniques of drawing from a holster, shooting multiple targets, reloading, safely moving with your firearm, and many other FUN-damentals! Eventually, Kippi and Debbie hope that you will begin attending our monthly practice sessions. For whatever reason you choose to own a gun, it is so very important that you not only learn how to safely and properly shoot, but also extremely pertinent that you shoot REGULARLY to increase familiarity, instill confidence and improve your skill set. At HerHandgun, we do not teach tactics, self-defense or state concealed carry requirements and law. However, we absolutely recommend that you educate yourself about the legalities of owning and carrying a firearm for personal protection and highly recommend the CCW and defense courses offered by Lance Nickell and Kevin Jeffries at ADVANCED DEFENSE SOLUTIONS, LLC. ***Important *** HerHandgun reserves the right to deny participation to or remove from class any individual based on any condition or circumstance that may possibly create an unsafe environment or situation. BASIC PISTOL 101 – For women who have never shot, are still new to firearms, have a CCW and want to shoot more, or want to improve their existing basic pistol skills (more information below). INTERMEDIATE PISTOL 201 – Come learn the basics of safe competition – Drawing, reloading, multiple shots, multiple targets. See course information below for requirements and more info. ADVANCED COMPETITION 202 – Attend this class to learn some of the more-advanced aspects of competition shooting – Shooting on the move, position setups, target acquisition, swingers, strong-hand shooting. Successful completion of the Competition 201 Class (or competition experience) is required before attending this class. PRIVATE, ONE-ON-ONE INSTRUCTION – If you are interested in a private class, contact Kip or Debbie at info@herhandgun.com. Full payment is due in advance for all private sessions. COUPLES CLASSES – Register for one of our group couples classes or schedule a private session for you and your significant other for a fun “date night”! 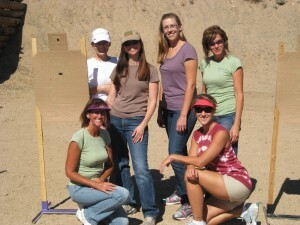 -Our Basic Pistol 101 Class is for any woman who is brand new to shooting. -The 101 Class may also appeal to women that want to brush up on their basic pistol skills. -If you have your CCW and want to expand your knowledge of shooting, this class is a good start! -No previous pistol / shooting experience required. -You must be 21 years of age or older to enroll. 16 – 20 year olds may be conditionally accepted, but parents must be present. $78.00 per person if you bring your own revolver or pistol with magazines. Student may supply their own FACTORY ammunition or purchase 9 mm from HerHandgun. $98.00 per person, which includes the “rental” of a .22 caliber or 9 mm pistol, and magazines. The cost of 100 rounds of ammunition will be additionally charged based on current retail value, and supplied by HerHandgun. Non-refundable $23 deposit is required to reserve a space in class. Balance is due in cash upon arrival at class. 3960 N. Usery Pass Rd. 100 rounds of FACTORY ammunition required. HerHandgun has 9 mm factory ammo for purchase. Openings are limited to 4 – 8 students, based on group experience and individual skills. If the class is full, we will notify you of optional dates. -Our INTERMEDIATE PISTOL / COMPETITION 201 Class is for women who want to begin competing in action pistol matches. -The 201 Class may also appeal to women that want to continue to learn new skills with their handgun, but don’t want to compete. -You must be 21 years of age or older to enroll. -Previous pistol / shooting experience is REQUIRED. Approved by HerHandgun instructors based on your experience. Full payment is due two weeks prior to scheduled date to confirm space in class. Non-refundable $ 20 deposit is included in cost of class. 300 rounds of ammunition required.